Under the direction of Pipe Major Bethany Bisaillion, the Sons of Scotland compete at the Grade 4 and Grade 5 levels and perform in some 50 concerts and parades throughout the year. We are committed to developing the talent of each of our members, producing quality music, and having a great deal of fun. The band is proud to be affiliated with the College of Piping in Glasgow, Scotland and the Ottawa City Piping College. 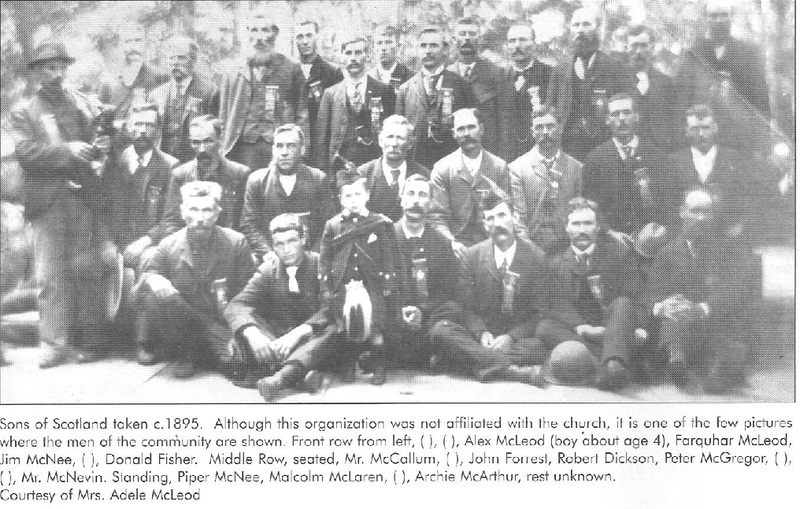 The Sons of Scotland, formed in 1896 by D.L. McLean, is Canada's oldest civilian pipe band. James Anderson led the band in the early 1900s. 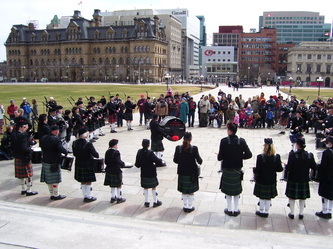 The band played in Ottawa for the first time in 1896 in celebration of the death of Robert Burns. It was in fact the first pipe band to be heard in the nation's capital. Unfortunately, little is known about the band's early activities. Jumping ahead, Pipe Major Alan Quinn breathed new life into the Sons of Scotland by forming a successful junior band in 1969. Under PM Quinn, the kids won best intermediate pipe band at the 1972 Landsdowne Park Highland Games in Ottawa and competed at the World Championships in Scotland in the early '70s. Morag Jamieson took over from Alan Quinn as Pipe Major in 1976. Under PM Jamieson, the band took second and fifth place in Grade 4 competitions in Cobourg, Cambridge, and at the Canadian National Exhibition. She also ran a private school of piping which had many talented and challenging individuals including Rob Crabtree, Bethany Bisaillion, Ross May, Lochie Bisaillion, Chris Bisaillion, Greg MacPherson and many others. Her work and legacy has continued in the area through the teachers and students, and she is a mentor to many. Alan Quinn was again Pipe Major in 1980 when he formed a senior teaching band. John Hodgins, a long-time band member, manager and supporter, booked an incredible 33 gigs for the Sons in a single year (1985). Quinn and Hodgins started the tradition of having the band play at the Sons of Scotland Camp Argyle #26's glamorous, annual Burns Banquet, which attracts several hundred people yearly. Liz McLeod took over as Pipe Major in 1990 and led the band until 1995, when Gord McNaule took over. Pipe Major McNaule appointed Fred Kuzniarz Lead Drummer. Both Gord and Fred were dedicated to raising the standard of the band, a trend that has continued through to today. In 1997, PM McNaule led the band into competition for the fist time in many years. 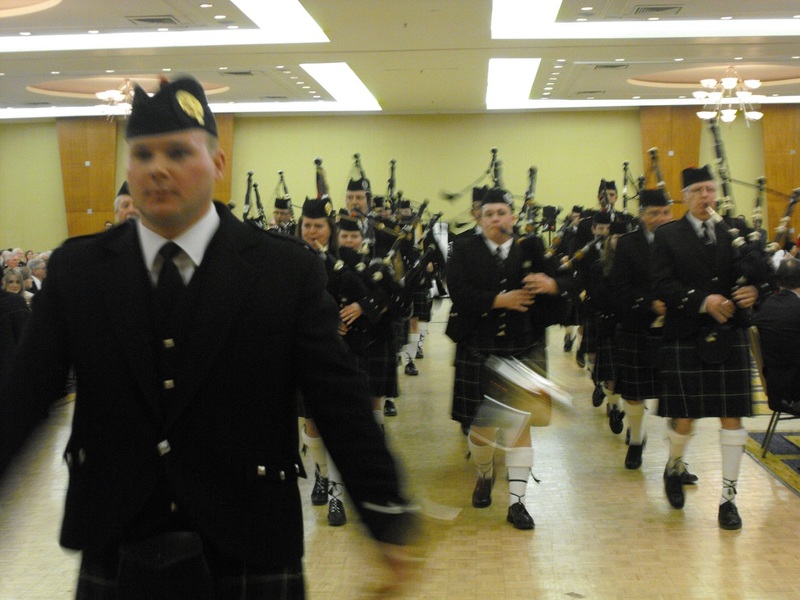 By 1999, the Sons had won two firsts and a third in parade competitions in New York and entered the PPBSO Highland games circuit, facing very stiff competition. In September 2000, Bethany Bisaillion joined on as Pipe Major. A dedicated teacher, PM Bisaillion has brought many new players to the band and has established a strong, organized learning environment for band practices. 2009 saw an expanded drumming program run by drum instructors within the organization, and it has produced quality, trained drummers keen to compete and parade with the Sons. 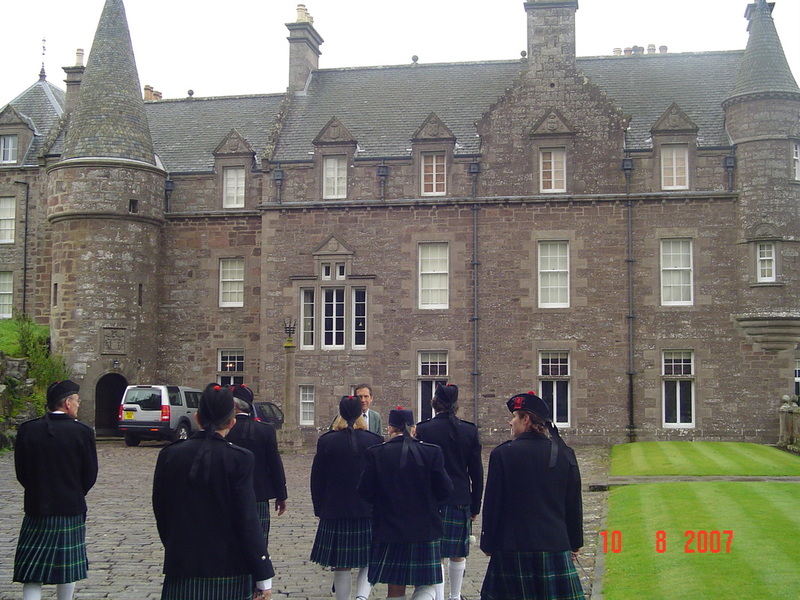 In 2003 the band added a trip to Scotland to their schedule. They traveled with dancers, parents and guests and played to appreciative audiences at spectacular venues such as Stirling and Edinburgh Castles. The band also performed on behalf of the Caledonian Brewery of Edinburgh and 21st Century Kilts and look forward to working with them again. Both trips were made complete by great results at the World Pipe Band Championships at Glasgow Green. The band is proud to support many area charities and community events - ALS Canada, the Sons of Scotland Benevolent Association, the Alzheimers Society of Canada, the Fallen Firefighters Memorial and the City of Ottawa are a few examples. The band also competes at highland games throughout the summer in Grades IV and V. The Sons do their own fundraising to purchase uniforms and instruments and offset travel costs. The band now has numerous officers and teachers, and strives to present excellent music to its audiences, The Sons provide free training in piping and drumming to all of its members, and encourages all players to participate in parades, shows and concerts. The band is also a proud supporter of the Ottawa Fire Services, and have often played at their events in support of their members and their charitable causes. 2010 saw the band help organize and run the 2010 Pipefest parade which is a global piping march in support of cancer charities, and the next one will take place in 2015. The band also takes trips to interesting places-their UK trips have become full of great friends, venues, and performance opportunities. The band started taking trips to Scotland in 2003, and they make their home base in Edinburgh. 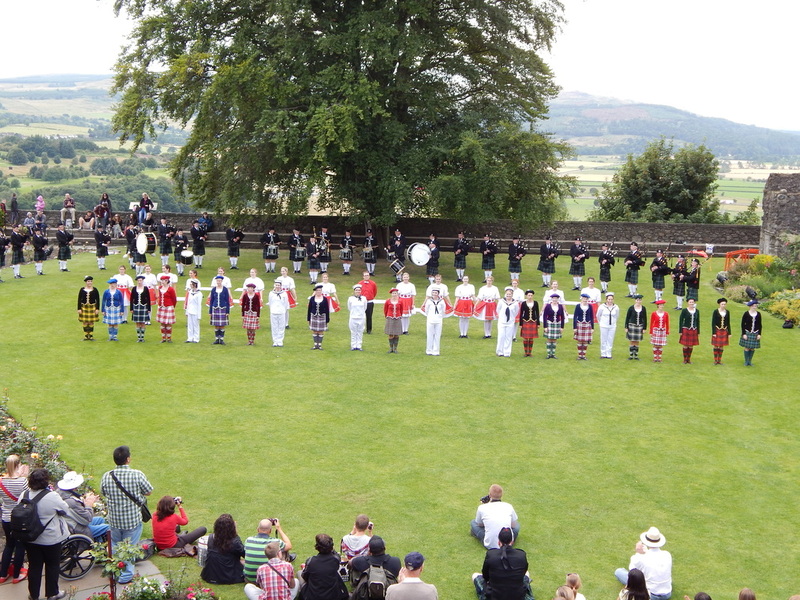 Each year the band makes plans to play at places including Stirling, Edinburgh and Blair Atholl Castles, at the Palace of HolyroodHouse and in the Pipefest Parade. We've been guests of The Highlanders at Redford Barracks, and played with the members of the Caledonian Brewery Pipe Band in informal parades and in pubs, kitted out in the world's best kilts made by 21st Century Kilts of Edinburgh courtesy of Howie Nicholsby. Our friends at Caledonian-Shakey, Boffin and all the staff are generous with their hospitality and good beer - and we show our support as often as we can both here and abroad. We've played at Edinburgh City Chambers for Lord Provost Hinds, at the home of Sir John A MacDonald in Glasgow along with Lord Provost Cameron, and at Belfast City Hall in celebration of that building's 100 year anniversary. 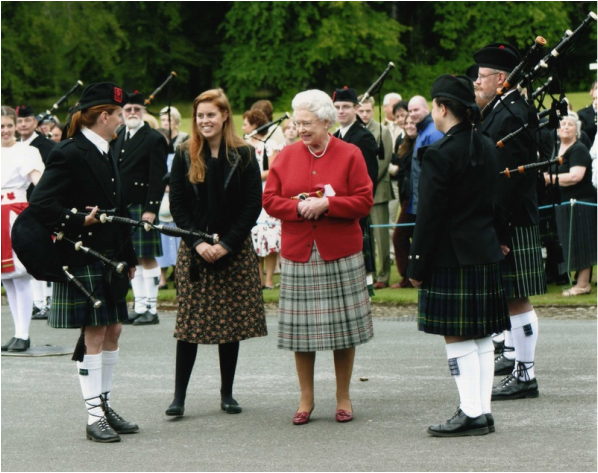 But one of the best highlights for the band has to be the private performance we gave for Her Majesty The Queen at Balmoral Castle in 2005. The band, dancers and guests made their way from Edinburgh to Balmoral on August 11 to play on the back lawn for a 45 minute show. In attendance were Her Majesty The Queen, Princess Beatrice, and the Queen's Equerry and Lady In Waiting. The band played a great performance along with the MacCulloch Dancers whose founder Rae MacCulloch and daughter Heather Forbes had the chance to meet The Queen and present her with a lovely gift. Rae had been a big fan of The Queen, and this was the first time in her school's 51 year history that they had danced for her. Rae, Heather, and the Pipe Major had the chance to have a nice walkabout with The Queen where she spent time speaking with many members of the band, the dancers, and then our guests! It truly was a grand occasion, one we'll all never forget. In 2006, the bands' 111th year, we celebrated with a return trip to New York for Tartan Week in April, and went to the UK again in August to compete and play at shows in Stirling, Edinburgh, Drummond Castle, and Glasgow and for the first time in London. 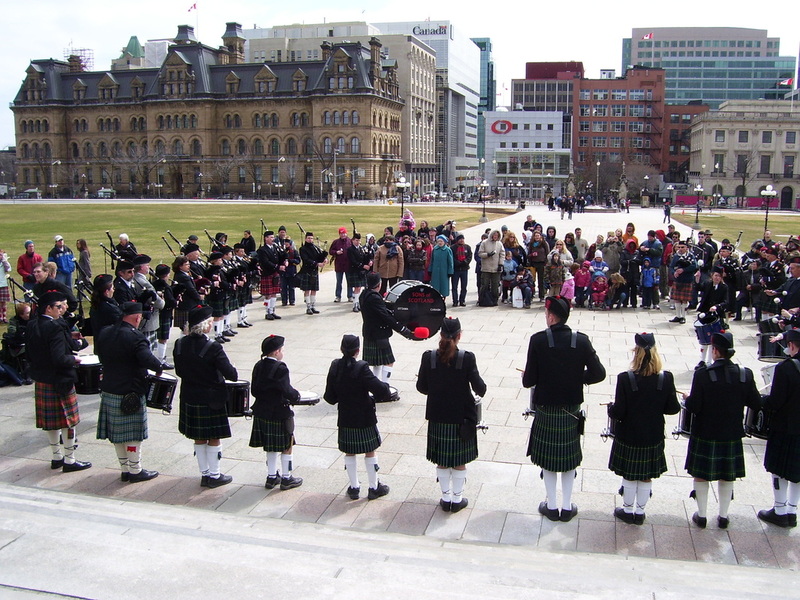 2008 also had another Tartan Day event, this time on Parliament Hill in Ottawa with 69 different tartans on display and sunshine to go along with the tall snowbanks. A visit by the British High Commissioner to Canada Anthony Cary, MP Scott Reid from Lanark, and former first Minister of Scotland Henry McLeish made the event more special. Sponsorship by Glenfiddich is now part of this annual event, to take place again in April along with the hopes of Canada's newest symbol being a part of the celebrations, the Maple Leaf Tartan as our nation's official tartan. 2009 and 2010 included trips to Scotland, Montreal, and New Hampshire, the continuation of our newly revamped drumming program, and lots of new pipers from outwith the Ottawa area. Our Vice Regal Patronage is so exciting for the band, and we look forward to expanding our teaching profile and providing opportunities to local youth with the inception of the first youth pipe band to be launched in the city. A trip to Scotland in 2011 to compete at the World Championships and to play at various venues including Blair Atholl, Stirling, and Edinburgh Castles, The Palace of HolyroodHouse and more - marked the bands' 115th anniversary. 2013 proved to be an interesting year as well with a return trip to Scotland and a performance once more for Her Majesty The Queen, and other members of the Royal Family, as well as many competitions, parades and concerts to round out our calendar. The band included Ireland on its agenda in 2015, and they participated in Pipefest 2015 in Edinburgh on August 7 as part of our journey to the UK. Another quick performance for Her Majesty as guest players with the Canadian Massed Pipes and Drums meant their 3rd chance to play at Balmoral Castle was so graciously afforded them. In 2017 they added a trip to London to their UK journey and performed in shows there. 2018 will add in a wonderful journey north to the Highlands and Islands,a fourth visit to Balmoral with guests from other cities in a special show for Her Majesty The Queen, and a potential trip to China! We are keen to see what this year will bring - our 122nd- as each year is superb and a lot of great music! We hope to see you out at an event soon!